We focus on specialized strategies to promote optimal health, longevity and fitness during and after cancer treatment. We are dedicated to promoting physical fitness and healthy lifestyle choices as essential parts of cancer management and recovery. We work closely with survivors and their healthcare team to promote optimal recovery, rehabilitation, and longevity for all persons affected by cancer. Our program empowers cancer survivors to make a positive impact on their overall health and prognosis. We provide a safe haven for cancer recovery. Early intervention can help to restore normal range of motion, help to reduce local inflammation and improve the function of the lymphatic system. Therapeutic Exercise Studies have shown that supervised exercise has significant beneficial effects both during and after cancer treatment. 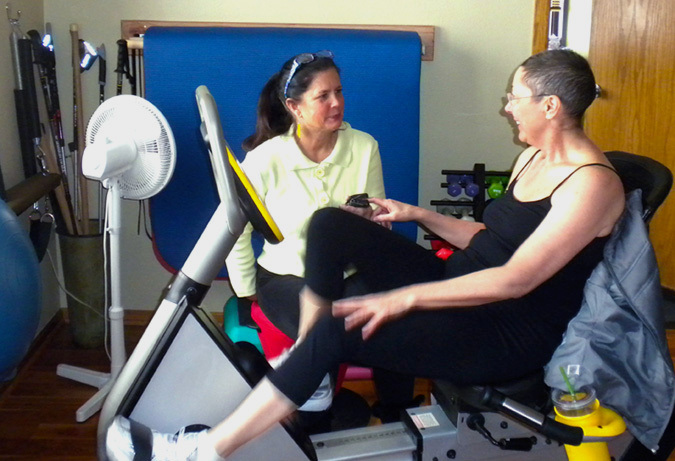 Exercise may be the best medicine we have for cancer recovery and to prevent a re-occurrence. Decrease the side effects of the cancer treatment. Improve immune system recovery and function. Preserve lean body mass and improve body composition. Develop focused strategies for cancer prevention. Improve psycho/social functioning i.e. depression, anxiety. Improve neurologic function and recovery from neuropathy. Improve balance and proprioception and decrease fall risk. Oncology Massage and Reflexology is the adaptation of massage to safely nurture the body mind and spirit of people recovering from cancer and cancer treatment. This light massage therapy technique in which the skin is moved in certain directions based on the structure of the lymphatic system. MLD techniques are designed to increase the movement of lymph and interstitial fluid from a compromised to uncompromised part of the body. These improve the efficiency of joint and muscle pumps, breaks down fibrotic tissue which can form as a result of long standing fluid build up, and prevent fluid building up again in an area which has been treated with manual lymph drainage. Schedule now for effective assessment and treatment.